Churchill Downs. Fenway Park. Wrigley Field. The Rose Bowl. The Los Angeles Memorial Coliseum. Soldier Field. It might be hard to believe, but that is the list of the oldest professional sporting venues in the United States, in order. Most of them make sense: they either sit in a large city, or established themselves so early that they became institutions. Then, there is Martinsville, nestled in the Virginia highlands only 10 minutes away from the North Carolina border. Just over 73,000 people live in the surrounding area, compared to the 13 million that surround the Rose Bowl and the L.A. Memorial Coliseum. Martinsville is a place that defies logic, even by NASCAR’s own standards. When the sport expanded to a full nationwide reach in the 1990s, places like Martinsville had their races moved to bigger locales like Dallas and Los Angeles. So why did Martinsville get to stay? As recently as the 1990s, Martinsville’s place on the NASCAR schedule was not certain. North Wilkesboro Speedway and Rockingham Speedway, two tracks that were near Martinsville and also in small southern towns, had their races stripped away. From 1996-2005, the four races at those two tracks were moved to New Hampshire, Dallas, and Los Angeles, and both tracks closed their doors as a result. To make matters worse, NASCAR alienated much of its traditional Southern fanbase by stripping a third track, Darlington Raceway, of its traditional Labor Day race, the Southern 500. After 54 years, that race was to be run outside of Los Angeles at California Speedway, beginning with the 2004 season. By the mid 2000s, many in the Martinsville community feared that they would be next. But as nearby tracks fell off the schedule, Martinsville was in a much safer position. Ownership from the International Speedway Corporation helped, since ISC was (and still is) one of the two major corporations that control NASCAR’s circuits. 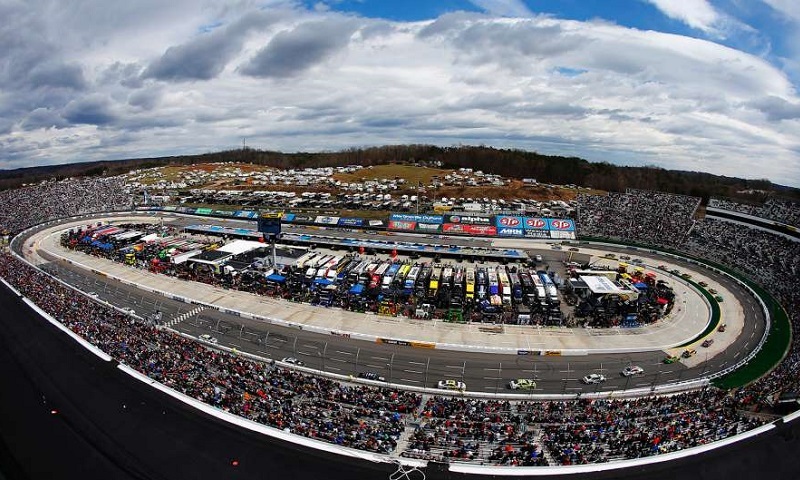 ISC chose to keep Martinsville for three reasons: its proximity to the Greensboro-High Point-Winston-Salem market, which has long led the nation in television ratings for NASCAR, its unique layout, and its history. Martinsville features two long straights and two tight corners. Many short tracks have tried to imitate either the shape or the banking of Martinsville, but no track in the country has the same combination of flatness and tightness like “The Paper Clip”. There’s nothing like it anywhere else in NASCAR. You have two chances to gun it like you’re in a quarter-mile drag race, only to have to make sure you make the hairpins that follow. It sounds simple, but in reality, it’s a massive challenge. Martinsville’s status as the shortest and narrowest track in NASCAR compounds all of this. Running room consists of two lanes at best, and on-track space is at a premium everywhere here, whether or not you’re racing for position or clearing lapped traffic (and here, you’re always doing one or the other). To no surprise, the phrases “bump and run” and “chrome horn” both originated here in the 1950s, because that was often the only way to pass someone. There was no room to race around someone, so you had to move them to advance your position. Despite all of this, the racing at Martinsville is beloved by fans and drivers alike. “There’s no more intimate and cool track to experience than Martinsville,” added seven-time champion and nine-time Martinsville winner Jimmie Johnson.